Marine biology majors at Northwest study marine organisms and their ecology, habitat and interaction. Faculty focus on ecology, or the study of organisms and their habitats; diversity, in organisms; and adaptations of organisms and diatoms, or the unicellular life of oceans. Students also learn best practices for surveying marine organisms. Northwest has an articulation agreement with the University of Southern Mississippi Oceanography program that provides students the opportunity to gain hands-on experiences by taking up to four courses in large water facilities. More than 86% of students who graduate with a degree in marine biology obtain employment or continue their education within six months after graduation. 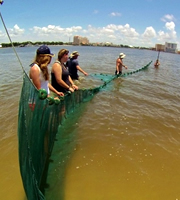 Northwest's affiliation with the Gulf Coast Research Laboratory (GCRL), an educational and research institute located in Ocean Springs, MS, provides students the opportunity to take field courses in marine science at GCRL during the summer. Garrett-Strong Science Building offers 26 labs where students gain profession-based experience on campus. The building is the home to the synthetic cadaver, aquarium, two museums and living animals that include a hedgehog, rats, iguanas and others kept in labs. Northwest students have access to a 300 gallon cold saltwater aquarium with a variety of marine plants and invertebrate and vertebrate animals. On a larger scale, nearby Mozingo Lake, the 102 River and Conservation Pond provide opportunities for students to develop primary skills in water-based survey, sampling and monitoring techniques. These resources provide necessary hands-on training opportunities for students and prepare them for future employment. Faculty-led research is an opportunity for undergraduate students to produce original research with the goal of publishing their work. This is available for students showing interest in furthering their education. Although internships are not required with a marine biology major, they are highly encouraged. During my oceanography course at the Gulf Coast Research Lab in Mississippi, our class visited Deer Island to take elevation profiles and seine the water. In the picture, my lab group was taking a turn seining to get an idea of what species were in the area. We were lucky enough to get a blue crab, some puffers and many anchovies. I had always been uncertain as to how one decides what they are meant to do, and at what point one knows what will make their life fulfilling. My summer at the Gulf Coast Research Lab was the first in which I felt content with my path toward becoming a marine biologist. 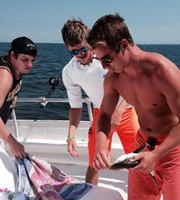 This photo was taken on-board the McIlwain research vessel in the center of the Mississippi Sound while attempting to not lose a finger to an Atlantic sharpnose shark during the second term marine biology course. Study Abroad is an opportunity for students to apply hands-on international experience to their academic development. Faculty members supervise short-term study abroad programs that prepare students before, during and after the program. Two types of study abroad programs are available – faculty-led and traditional study abroad. Students from the natural sciences department have recently traveled and studied in Hawaii. What Can I Do With a Major in Marine Biology?